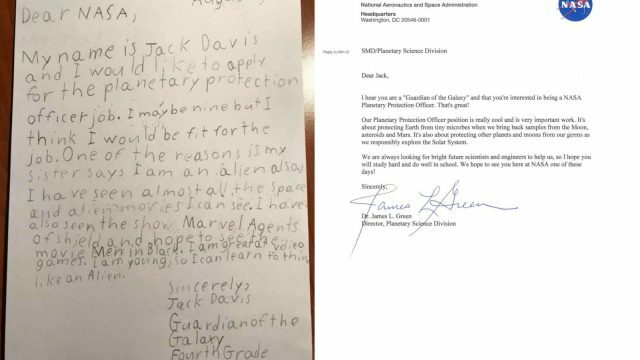 Last week we reported that NASA was advertising a job vacancy for Planetary Protection Officer and it took the internet by storm. This week it seems to continue to go viral thanks to a 9-year-old boy. “My name is Jack Davis and I would like to apply for the planetary protection officer job. I may be nine but think I would be fit for the job. One of the reasons is my sister says I am an alien also I have seen almost all the space and alien movies I can see. I have also seen the show Marvel Agents of Shield and hope to see the movie Men in Black. I am great at video games. I am young, so I can learn to think like an Alien. I hear you are a ‘Guardian of the Galaxy’ and that you’re interested in being a NASA Planetary Protection Officer. That’s great! Our Planetary Protection Officer position is really cool and is very important work. It’s about protecting Earth from tiny microbes when we bring back samples from the Moon, asteroids, and Mars. It’s also about protecting other planets and moons from our germs as we responsibly explore the Solar System. So NASA might be looking forward to working with Jack in the future but for now, the vacancy is still open but time to apply is running out.